Whenever, wherever: why repurposing content is key to engaging your audience anytime, anywhere. 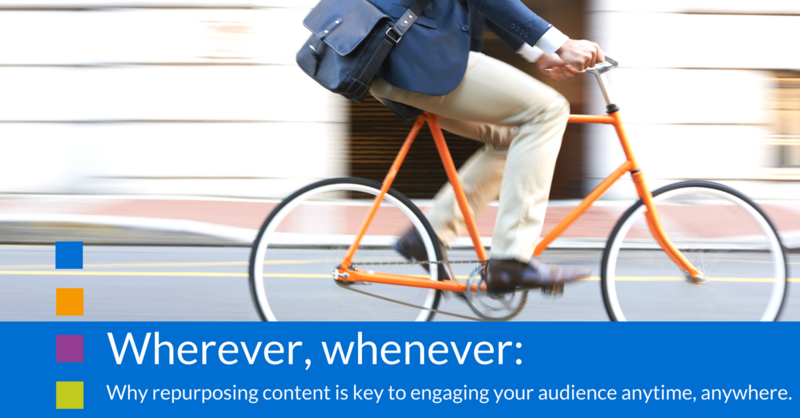 Wherever, whenever: why repurposing content is key to engaging your audience anytime, anywhere. Imagine if your wardrobe could only consist of one outfit; no matter which clothes you chose, they’d often be inappropriate. The same logic applies to your content; no matter how great a single asset is, it won’t be appropriate in every context. As a result, you’ll often miss the opportunity to engage your audience in the conversation. For example, imagine (but please don’t try) reading a whitepaper on your phone, whilst cycling to work – tricky, right? So, to maximise the effectiveness of your content, something’s got to change. Either your audience must engineer a situation in which they can consume your content, or you need to repurpose your message so that you’re able to get your message across wherever, whenever. Many marketers are reaping the benefits of the latter approach. Leading translation software provider, SDL, supplemented its industry-leading research report with a separate overview of the 5 key themes. This summary received more than twice as many downloads than any other SDL eBook, ever, and allowed SDL to engage in brief, yet full conversations with those pushed for time – an opportunity they would otherwise have missed. Meanwhile, newspapers, like the Wall Street Journal, now create their editions in podcast form, allowing subscribers, who don’t have time to read the news in the morning, to listen to it on their drive to work, or on the train (for those of us who remember our earphones!) – facilitating a conversation that might otherwise never have happened. If you’re only publishing your message in one form, you’re missing the opportunity to talk to your audience anywhere, anytime. Repurposing that content into a few shapes and sizes means you’re ready and able to have the conversation whenever, wherever. And consider this; it’s not just digital content that can be repurposed to better fuel conversations. Check out how Xerox repurposed a fruitful keynote speech into a piece of sales collateral that fuelled follow-up discussion with prospects. And be sure to follow us on LinkedIn to keep updated with our latest content marketing thoughts, ideas and insights to help you fuel conversations, with your audience. Liven up video with B-roll footage What type of video content should I make?